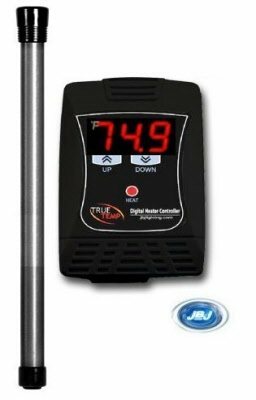 JBJ launches the TRUE TEMP digital heater controller, the most accurate and precise controller in the aquarium industry. The latest TRUE TEMP boasts unparalleled +/- 0.5 F accuracy, a calibration setting, smart memory chip, LED heating display, and a large constant LED readout of the present temperature. Keeping the proper temperature for tropical fish may be the single most essential element for a thriving aquarium. Since fish are ectothermic, meaning they lack the ability to control their own body temperature, it is vital that they have steady water temperatures with minimal fluctuations. Many fish cannot handle stress from frequent temperature changes, which results in a compromised immune system. This escalates the likelihood of preventable diseases, parasites, and bacterial infections. Don’t be fooled, some controllers still use analog dials and knobs without the exact accuracy of TRUE digital controllers. Our state of the art microprocessor constantly reads and shows the right temperature with a LARGE LED Display. Easy push buttons make setting your required temperature simple and convenient. Plug any heater up to 1000 Watt max. load into the controller with no hassle. The TRUE TEMP features a 3 prong receptacle for virtually any heater plug. This immediately provides a temperature readout between 0-99F and a temperature set point range between 32-99F. Have you ever realized that most heaters cannot be calibrated. Oftentimes errors do happen while calibrating. The capacity to cross reference ensures your temperature is exact and always correct. An integrated smart memory chip will restore the prior temperature set point and calibration as soon as the power returns after an outtage. This relieves you of having to manually reset your temperature forever. Many heaters have an integrated temperature probe within the same heating element. This can lead to incorrect readings and premature ON/OFF cycles. The TRUE TEMP digital controller features a remote quick disconnect temperature probe that can be used up to 5 feet away from the heating element for a comprehensive temperature measurement of the total volume of water. Quick disconnect temperature probe gives convenient replacement without the need to replace the entire controller in case it quits working.